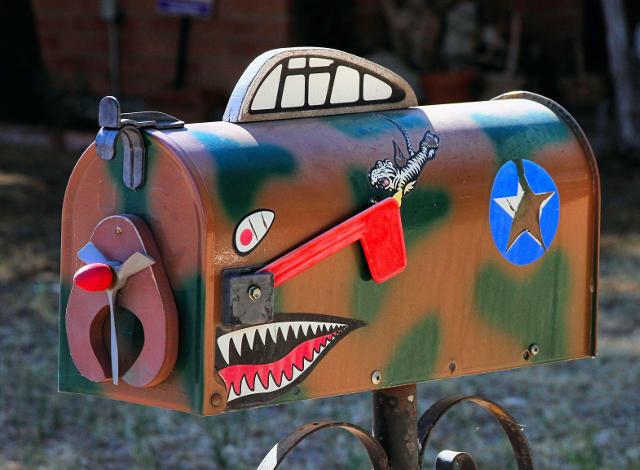 The design on the Airplane mailbox is based on a Curtiss P-40 Tomahawk Fighter Plane. It was used in China by the American Volunteer Group (the Flying Tigers) in WWII. They were in China from 1941-42 and they downed 296 Japanese planes while losing only 14. Damned good shooting! I wondered whether there might be other mailboxes like this one around the country, so I pasted the photo into Google Image Search. (Once you go to the page, click the camera icon and you can upload a photo to search for.) All Google showed me were photos of cars. Amazing find! Thank you, David.